Total Workshop search results: 10. Displaying Page 1 of your woodworking search phrase CHILDREN SILHOUETTE. This halloween boneyard fence project is a fantastic entrance for your property walkway or set up in the yard along with our Boneyard Fence panels 05-WC-0030 (available in 3 sizes) and our collection of over 100 zombies! Display to decorate your yard, along the patio railing, up the sidewalk to the front door or even a big window store display! Choose to paint as little or as much detail as you want. Or experiment with black and grey tone silhouettes to create your own custom decoration! Custom sizing available upon request. The walkthrough spacing is about 80 inches in height at the center arch of the snake banner and 27 inches wide. Just wide enough for an adult to squeeze through and plenty wide for children. This Thanksgiving silhouette design features a two pilgrim children sharing a prayer of thanks alongside a cornucopia filled with the annual harvest from the farm. This fun silhouette is a great way to greet visitors to your home, a yard sign poke or your office desk! Custom sizing available to make this a yard art size project. This Thanksgiving silhouette design features pilgrim children sharing a basket from another year of harvest bounty. This fun Halloween silhouette is a great way to greet visitors to your home, a yard sign poke or your office desk! Custom sizing available to make this a yard art size project. This Thanksgiving silhouette design features two pilgrim children walking arm and arm with a bountiful basket harvested from the farm. This fun silhouette is a great way to greet visitors to your home, a yard sign poke or your office desk! Custom sizing available to make this a yard art size project. This Thanksgiving silhouette design features two pilgrims welcoming you to their harvest celebration. This fun silhouette is a great way to greet visitors to your home, a yard sign poke or your office desk! Custom sizing available to make this a yard art size project. This Kitty Silhouette Chalkboard and Eraser is sure to be the purr-fect addition to your busy household. While the sample is made to hang on a refrigerator using Rare Earth magnets, you could also add a picture hanger and hang in on a wall or add a support on the back to stand it on the counter. There is also a place for your chalk. Makes a great scroll saw project that even a beginner can easily accomplish. This is a vintage woodworking plan. Visit our FAQ page for a full definition. View the Larger Image Slideshow to see the actual item you are buying. The drum lamp may be turned on a lathe, or its top and base may be sawed out and mounted upon a tin can. This craft pattern shows how to make the lamp, with a silhouette of a drum major to mount upon a lamp shade (you supply shade). 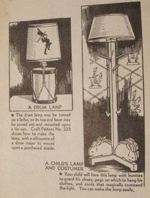 With regards to the childs lamp and costumer,your child will love this lamp with bunnies to guard his shoes, pegs on which to hang his clothes, and cords that magically command the light. You can make the lamp easily. Tall lamp base is 48 inches.